In high school, the BFF and I would go to the school cafeteria almost every day during the morning break and buy muffins and drinks, usually a hot chocolate or chocolate milk. I remember looking forward to that sweet morning treat. It was a comforting ritual performed with great eagerness. Surprisingly, our school had some pretty tasty food, unlike the gruel that normally comes to mind when one thinks of cafeterias. I was a typical bratty, self-involved teenager, and one hideous thing I routinely did was throw away the lunches my mom laboriously and lovingly prepared for me at 5 a.m. when she would wake up to go to work. My older sisters were generous with their hard-earned cash and kept me supplied with money for rubbish like instant noodles from the vending machines, Mr. Tube Steaks discounted from the school store at the end of each day, and daily post-school excursions to the neighbourhood McDonalds. 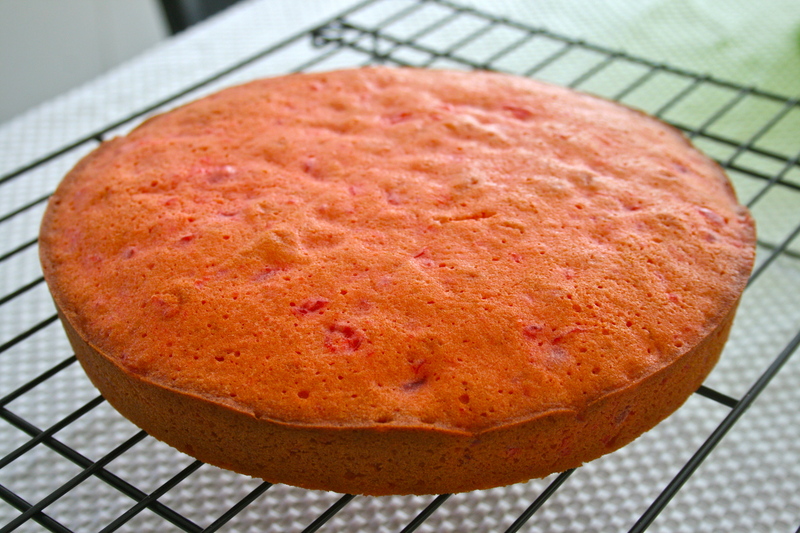 One of the items that still stands out in my mind, some 14 years after high school, is a cherry chiffon cake that was periodically offered during lunch. 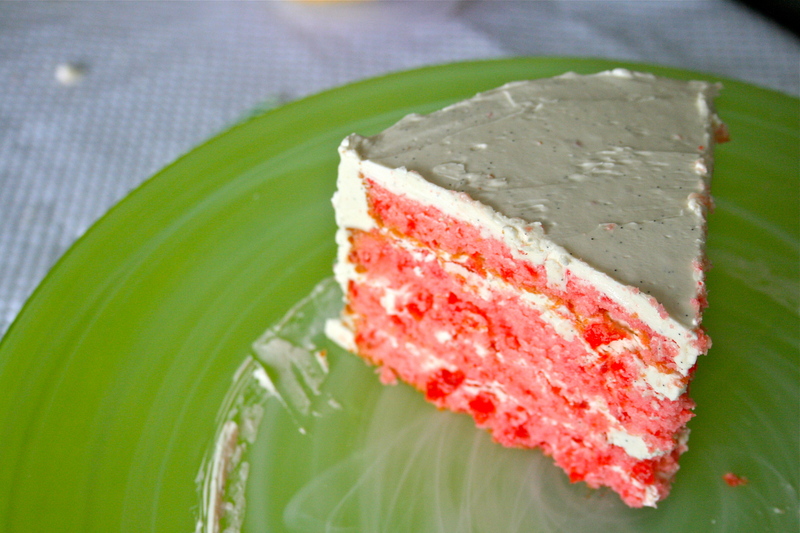 I remember a tender, moist vanilla cake infused with the flavour of cherry and coated in a sweet, satisfying frosting. Birthday cake number two is going to be my attempt to recreate and capture the essence of that cake. 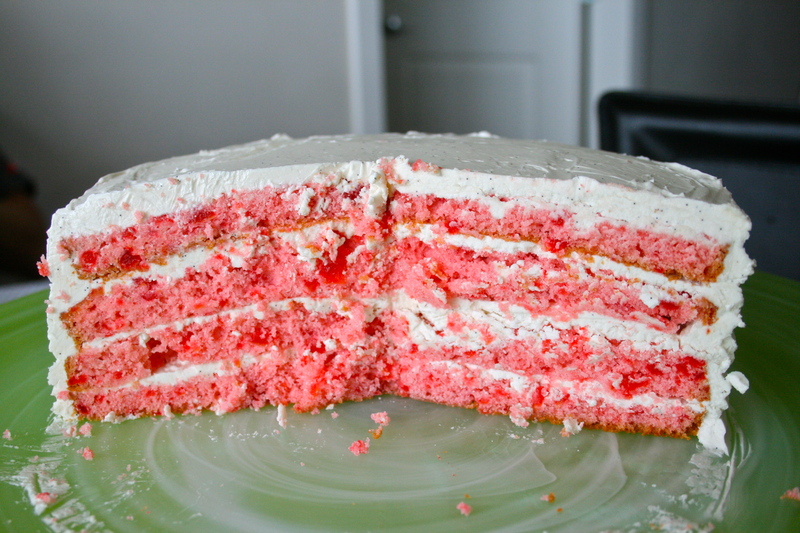 I found an absolutely stunning cherry vanilla layer cake here on the beautiful Sprinkle Bakes website. 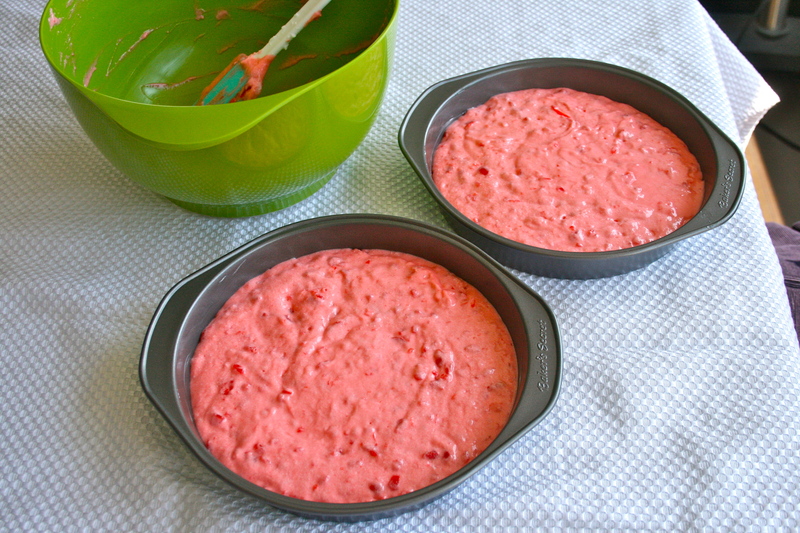 I only made two changes to the recipe – I used an entire 375 mL bottle of maraschino cherries, which according to the conversion calculator online, comes out to more than 10 ounces. 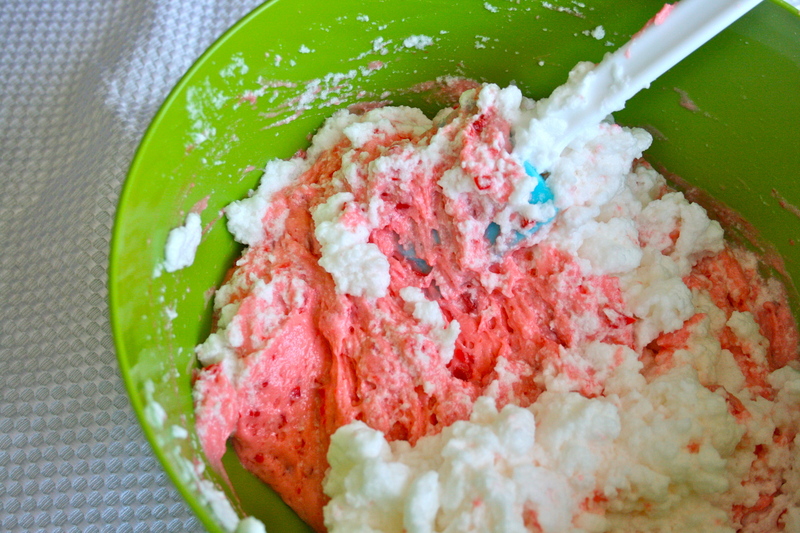 I used under a cup of sugar instead of 1 1/4 cup (although next time I’d use even less – perhaps 3/4 cup. I found the cake a bit too sweet due to the maraschino cherries & juice). I didn’t have to use any food colouring to get that glorious red colour. 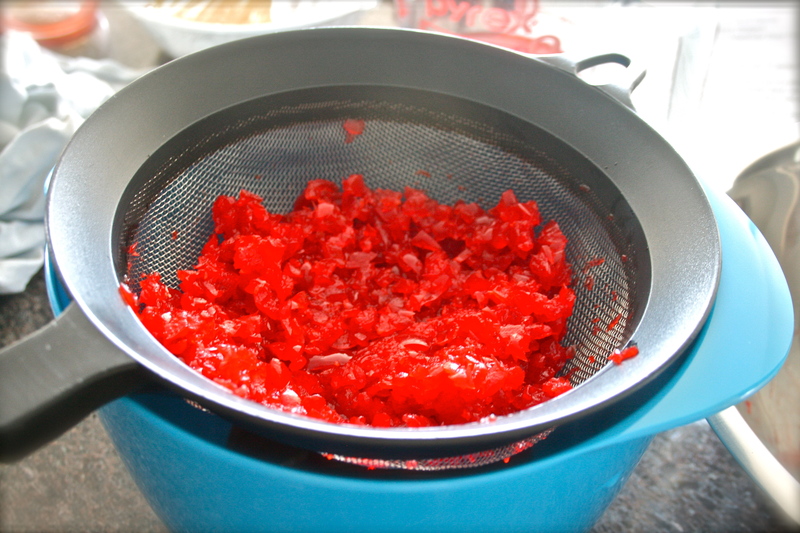 After chopping the maraschino cherries, I pressed them through a sieve to get as much juice out as possible. I didn’t want a soggy cake. 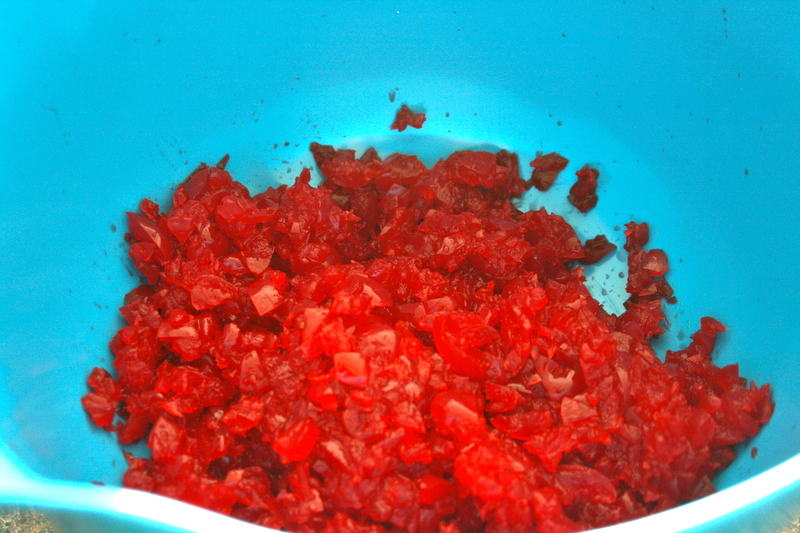 Folding in the chopped cherries. 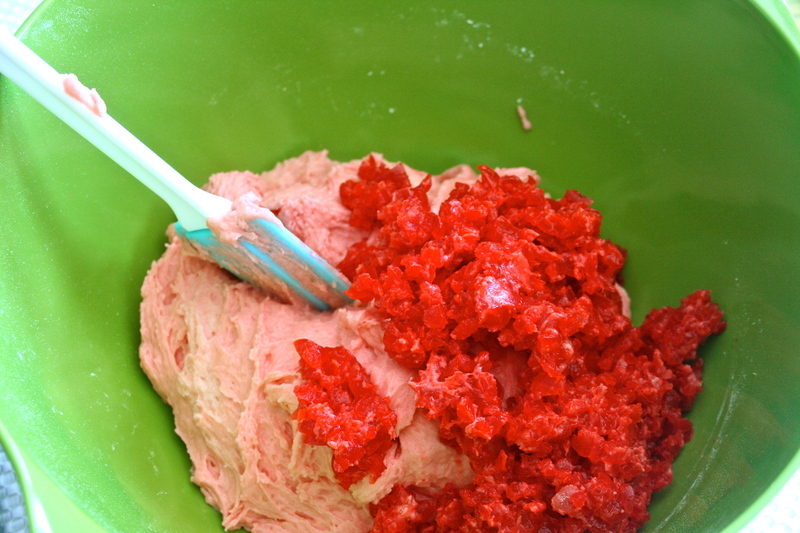 Look at that gorgeous red batter, studded with ruby coloured cherries. 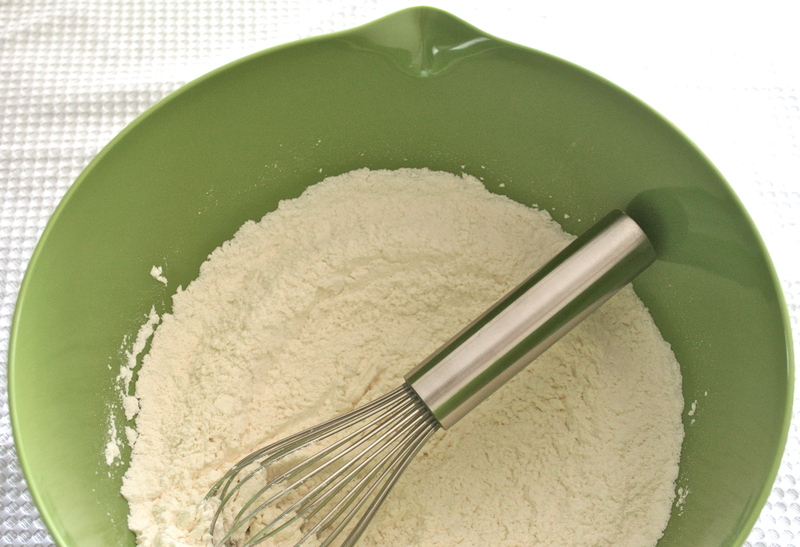 Folding in whipped egg whites for a lighter, airier cake. For the icing, I consulted Sweetapolita’s invaluable, fabulous website. This woman does magical things with cake and frosting, and she posts super helpful how-to videos for baking novices like myself. 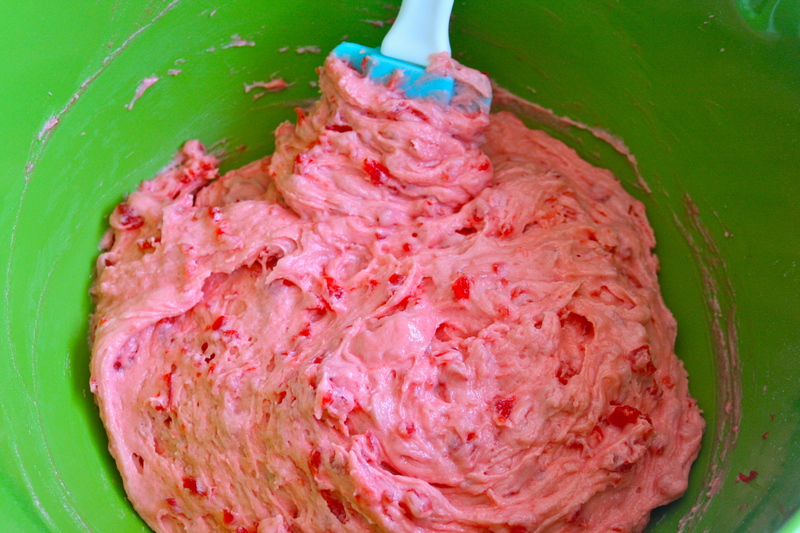 I decided to use her whipped vanilla bean frosting, recipe found here. I used only 1 1/4 cup of icing sugar because I don’t like my frosting too sweet. 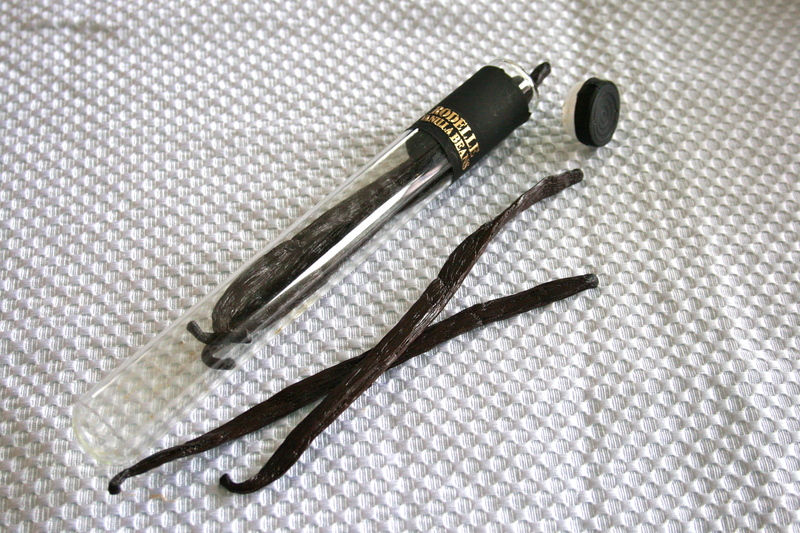 Finally, a reason to use my vanilla beans! It’s amazing how whipping butter for a total of 15 minutes transforms it into something so silky, glossy, light and creamy. 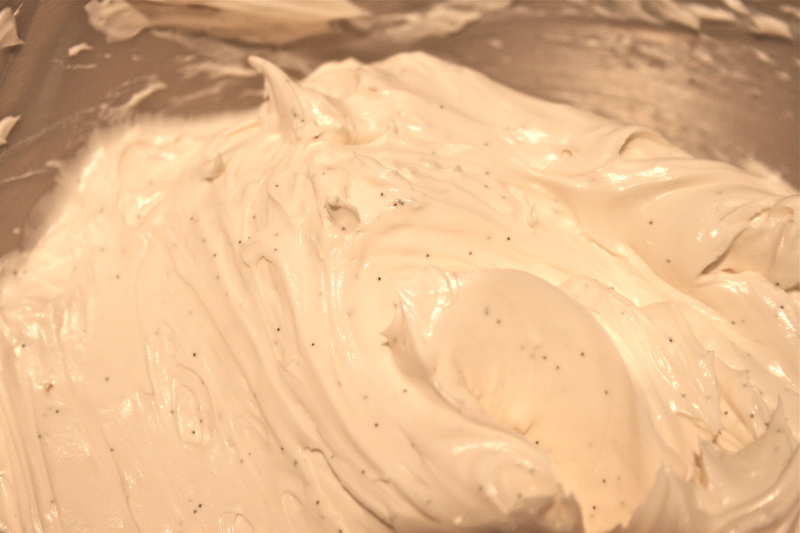 And I loved seeing all the specks of vanilla against the pale white frosting. My layers were pretty horrendous. Oh well – I’ll just hide it with frosting. 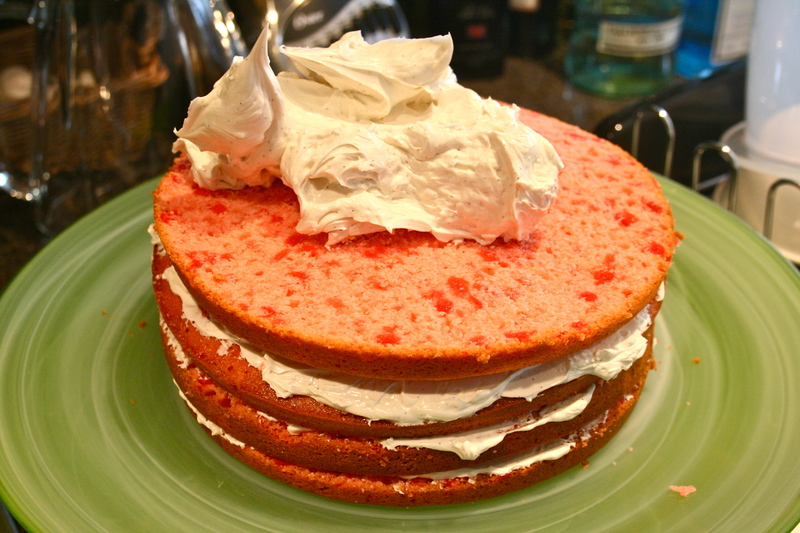 Making beautiful layer cakes is definitely not my forte, but it’s fun to do. We had all our friends come over to our place for a birthday BBQ. I was excited to see how the cake turned out. The cake was moist, dense, and flavours of cherry, almond and vanilla (even though the recipe didn’t call for any vanilla!) really stood out. The cherry, of course, was the star, but a friend immediately picked out the almond notes. 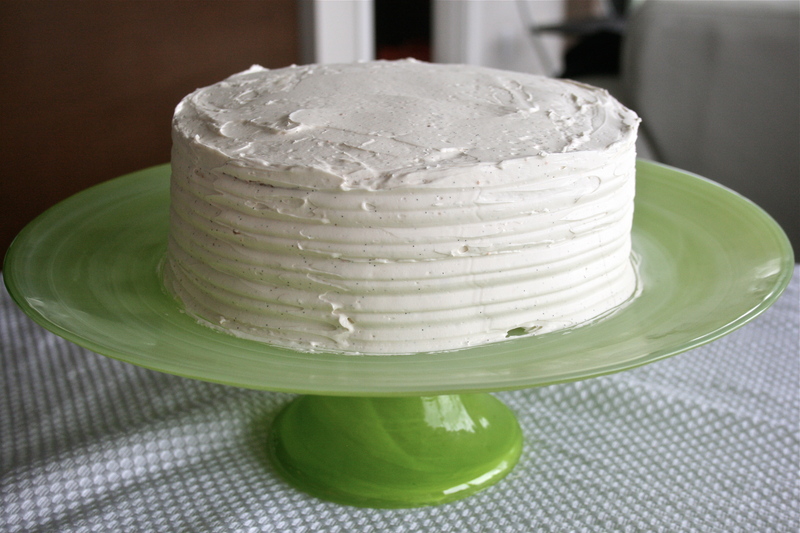 The whipped vanilla frosting was the perfect complement to the cake, smooth and creamy, melting on the tongue and tempering the cake’s sweetness. It wasn’t exactly like the cherry cake of my teenage years, but it definitely satisfied my craving for that flavour profile. 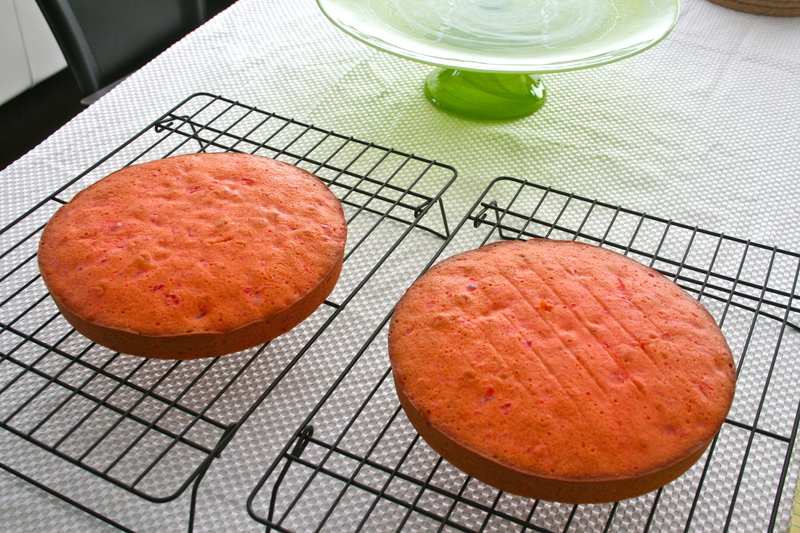 Several people asked me whether or not I’d was going to bake my own birthday cake. Why, of course – two in fact! 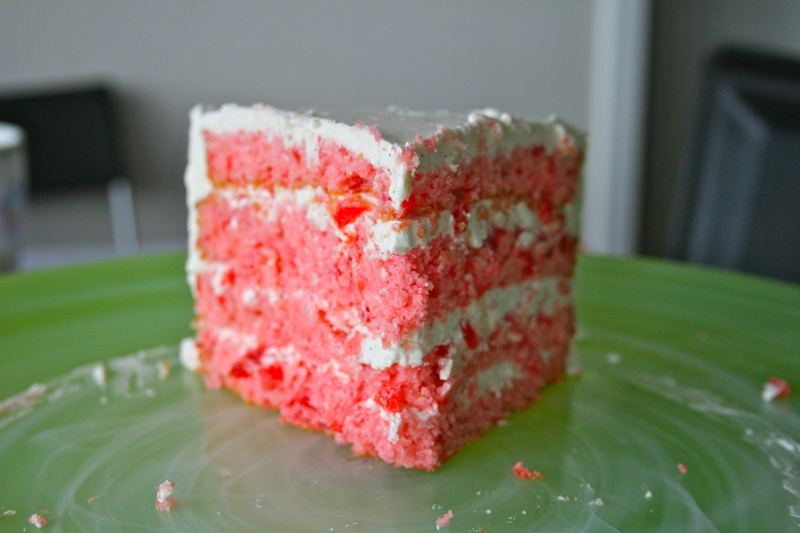 YUMMY LOOKING……you love baking so much and your blog is fab! I look for it every day now and miss when I don’t see it. Perhaps a career change? What a beautiful cake!!! Love it! 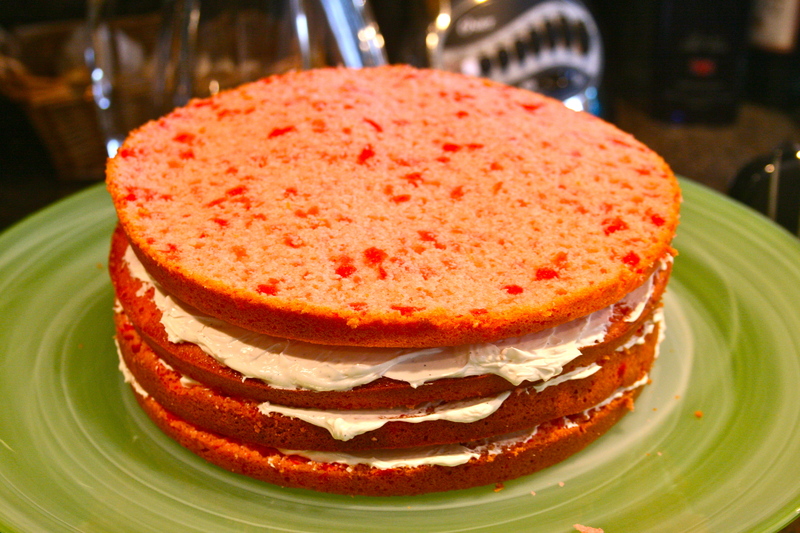 Something tells me YOUR cake was better than the cherry chiffon cake that you had back in school. This looks so beautiful, fluffy and delicious! Um, can I come over and eat a piece of this cake 😉 It looks amazing. I’ve bookmarked this recipe for later. Love your site. Thanks for the love, Jennie! 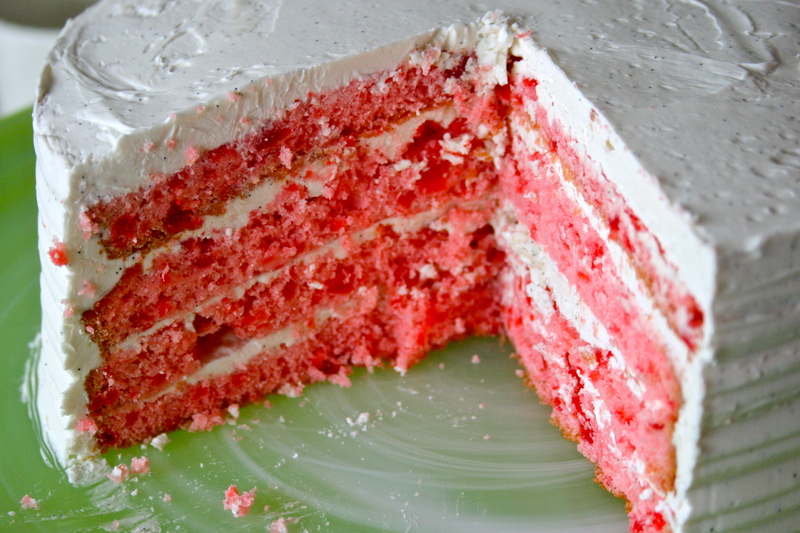 That’s the most beautiful pink cake I’ve ever seen, and I love vanilla specks in my cakes and frostings too, so pretty! Thanks so much, Jasline! I love the vanilla specks too – I’m going to try using them more often just so that I can appreciate the subtle beauty. Yum! Nice frosting job too! Thanks, Mama! It was my first time trying to do something fancy w/ frosting. Thanks, Jo! I was super relieved it turned out.